Firstly, thank you all for the great response to Kumnooh’s arrival last week. Last time the listings were heavy in visual arts, this time around it seems the events are in cinema and publishing. This week is dominated by the Memory International Film Heritage Festival running through until Sunday 9th. Free screenings of world cinema on the theme of dance, including Powell/Pressburger’s The Red Shoes, West Side Story, a selection of Chaplin and Tati, and L’oiseau de Paradis, shot by Marcel Camus (Black Orpheus) in Cambodia in 1962. These big screen presentations are at Chaktomuk Theatre on the riverside, and there also a fantastic exhibition of repainted vintage cinema posters open all week. 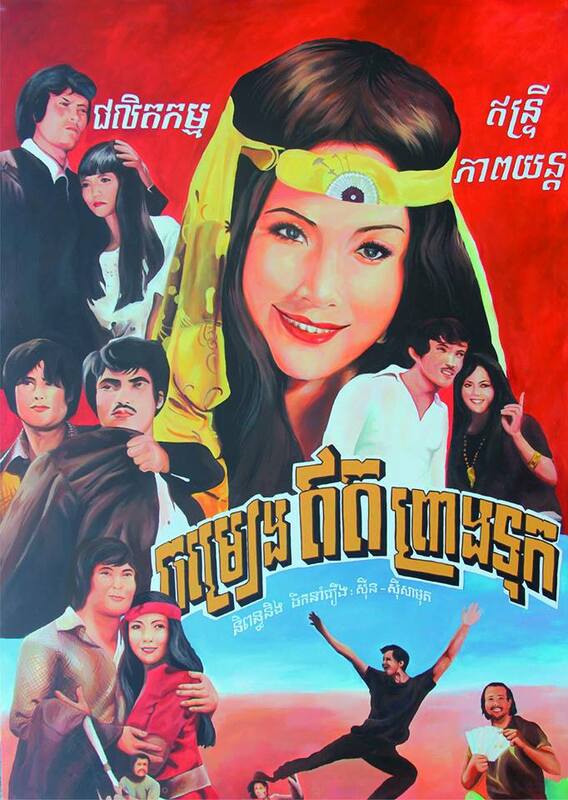 Additional events include: a screening of Le Sommeil D’or, (Golden Slumbers), Davy Chou’s investigation into the lost and found Cambodian cinema of the 1960s at Bophana Centre tonight at 6 pm; a series of presentations, workshops and forums on film heritage; and two cases of Dengue Fever, live on Koh Pich tomorrow and on screen at Bophana in Sleepwalking through the Mekong on Thursday at 6 pm. entitled Exiled to Nowhere, in which photojournalist Greg Constantine exposes the plight of the Rohingya, a Muslim minority from Rakhine State in Burma, one of the most oppressed ethnic groups in the world. Greg will present a slideshow, and copies of the accompanying book Exiled to Nowhere will be available. provocative. Note: no translation, but with a strong visual style. Arts, behind Parkway Centre, with access through St 173. Make yours a creative week, support an artist near you! work of Australian photographers from the UNTAC period, 1992-1993. Meta House (Art Cafe), Sothearos Blvd. Until 6 June. Sothearos Blvd. Until 13 June. Séra and American poet Julianne Sibiski, at Romeet Gallery on St 178.
examines bullfighting in Colombia. Chinese House, Sisowath Quay. Café on Sihanouk Blvd. Until July 7.
on Sotheros Blvd . Until 14 July. September); Monday to Saturday, 7 pm (October to April).